The Sign King is a most trusted name in the topmost companies in Business Cards Printing Service in San Diego. We print premium business cards from our San Diego based print shop which definitely provide the quick and easy representation of your company’s brief products and services offering. Business cards not only showing the logo and color theme identity of your company but also shares the contact name, phone numbers, websites and e-mail address. The Sign king experts in all type of business card printing and offers different materials of business cards in San Diego with affordable price and quickest delivery. We offer a huge variety of business cards so you are also welcome to come by our San Diego print shop anytime during business hours to see samples and compare different types of business cards. From basic business card printing all the way to custom and unique high-end business card printing, we make all types of business cards and produce great results. We promise to make a great first impression with your business card. The business cards are the single most important marketing tool a company uses. But often, its importance is overlooked. You only get one chance to make a great first impression. From basic card printing all the way to custom and unique high-end printing, we make all types of business cards and produce great results. This is why our customers refer their friends for printing their business cards from us and we believe you will too. Please feel free to contact us directly with any questions. We offer a huge variety of cards so you’re also welcome to come by our San Diego print shop anytime during business hours to see samples and compare different types of business cards like Glossy cards, silk cards, velvet cards, tent cards, foil cards, Cotton Cards, Die-Cut cards and many more. Feels Dry or Natural. Great for un-coated needs such as loyalty cards, punch cards or buy 10 get 1 free cards. Easy to write on with any pen and will not not smear like other stocks. This heavyweight 32pt uncoated card is twice as thick as standard business card and feels great in your hand. Customize with optional edge painting available in metallic colors or leave classic white for a minimal design. Elegant and traditional, these cardstocks are printed in full color or just 1 color if you prefer. No foil or glossy coating make these simple and timeless. *Please note we are no longer offering raised ink process. Tent cards give you twice the space for your message. Stand them up on on their side. Tent style: 4" x 3.5" with score to fold to 2" x 3.5"
Card style: 7" x 2" with score to fold to 3.5" x 2"
Printed on 14pt cardstock and scored for easy folding. Soft to the touch, they bestow a hint of luxury to brands and create marketing pieces that stand out from the competition. Printed with high quality equipment on 16pt card stock, then they are laminated on both sides with 1.5mil scuff resistant, soft velvet laminate, which give them a substantial thickness of 19pt. Silk laminated cards are graceful and luxurious, regal in appearance, and soft to the touch. This card is laminated on both sides with a special laminate that gives it a silky smooth feel, and also makes it tear and water resistant. Adding the spot uv in gloss gives another layer to your card. Then bring in the effects! The possibilities are endless to make a eye catching and destinctive card. This heavyweight cardstock feels smooth and can highlight the contemporary design when a matte finish is preferred. 3x the thickness of standard 16pt cards with silk lamination both sides. Customize them using Foil, Spot UV, Embossing, or any of the card add-ons. Silk laminated cards are graceful and luxurious, regal in appearance, and soft to the touch. This card is laminated on both sides with a special coating that gives it a silky smooth feel, and also makes it tear and water resistant. You will love your new Silk Cards! Give customers the ideal way to gloss things up with eye-catching spot UV effects! Suede Raised Spot UV Cards feature smooth glossy raised areas that contrast beautifully with the Suede/Soft Touch Laminate foundation of the cards. This product will make you the envy of all your competitors, and your customers will be thrilled with all of the compliments they receive on their classy new cards. Suede Raised Spot UV Cards are real game changers for folks who want to exude style, elegance and class. Suede with Raised Foil Add a flash of brilliance to suede cards that you can see and feel. The combination of raised foil contrasted with the velvety smooth suede foundation creates a tactile experience that customers can see and feel. Metallic embossment effects can enhance amazing detail in images, special accents, and logos. The Suede Cards are printed on 16pt card stock, laminated on both sides with 1.5mil scuff resistant, soft velvet laminate, which give them a substantial thickness of 19pt. Holographic: Holographic Raised Foil brings a multicolor, 3-D (three-dimensional) effect to your printed product. 20pt Plastic cards are a great inexpensive alternative to the thicker 30 mil plastic cards. Weatherproof and unique but economical at the same time. 30mil plastic is identical to a credit card. These work great for a high end business card, loyalty, club or gift card. If a strong, water and tearproof card is what you are looking for, then our plastic cards are just what you need. Stocks: White, Pearlecent silver, pearlecent gold, frosted with and without white backer. Add on ideas: foil, silk lamination, spot gloss, barcoding, embossing, numbering, signature panel, scratch off area with PIN printed, white backer, magnetic strip and data encoding. For larger quantities, please click on custom quote. These cards are pearlescent and has a gorgeous shine. Very Similar to Stardream cardstockThe paper shimmers in the light, has a beautiful soft sparkle and is metallic on both sides. 22pt Onyx Suede Business Cards. Suede Cards impress anyone who touch it. One of a kind, luxurious and elegant, these cards are made of the smoothest curious feeling black cardstock. This card is perfectly accented with choices of Foil and Spot UV gloss. Includes 1 color of foil per side in the base price. Regular and Raised spot uv also available on this cardstock. These magnetic business cards are great for displaying on a kitchen appliance, filing cabinet, truck dashboard — any metal surface. It's the perfect way to help customers remember your brand and create repeat business. Same size as a standard business card but magnetic. Great for restaurants, delivery service and professionals. 22pt Luster Business Cards feature a brilliant Luster shine with high gloss lamination. This is far more glossy then regular UV coating. Make a lasting impression with extra durable, water resistant, glossy business card. Luster Cards are printed with high quality offset equipment on 16pt card stock and then they are laminated with an optically clear 3mil gloss laminate on both sides, making the cards an extra beefy 22pt thick. Linen is a semi-rough paper that emulates the look of linen cloth with slightly lifted grooves to give a textured feel. There is something about textured cardstock that is wonderfully rich and intriguing. 4/4 with White Ink mask option. For a homegrown, personalized touch! Thick, rich, light brown kraft paper has natural fibers and subtle visible flecks to give Kraft Cards an organic look and feel. Kraft is 100% recycled with a minimum of 30% post-consumer waste content. Brown Kraft paper is light brown with natural fibers and subtle visible flecks lending it a natural, organic look and feel. The uncoated smooth finish provides excellent print quality, while the colored stock adds warmth and a rustic appeal to images. Optional white ink can be applied in specific areas or all over giving you the flexibility to add contrast and brighten images. Please be aware that recycled and colored stocks may have slight color variation due to the materials used to manufacture the paper. The flecks in the paper will also vary from sheet to sheet and press run to press run. 16pt UV Coated, full color business cards are far more superior to plain black and white business cards and are sure to leave a lasting impression. Stock: Frosted with and without white backer. Foil Stamping on Silk Cards. 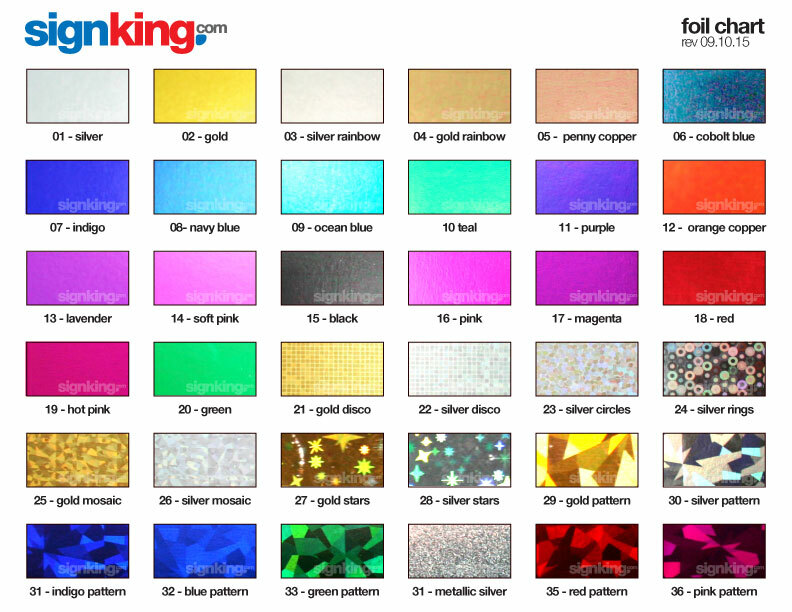 36 Foil color options available. Overnight / 24-hour business cards. Order today and they are ready to ship out or pick up tomorrow. Sometimes we even finish them the same day, sometimes in just a few hours. Using the all new Xerox high end digital color press, we can print and delivery high quality business cards almost immediately. - 16pt Smooth - This matte finish stock is very similar to press run 16pt smooth and has a very slight gloss sheen, with NO UV coating. 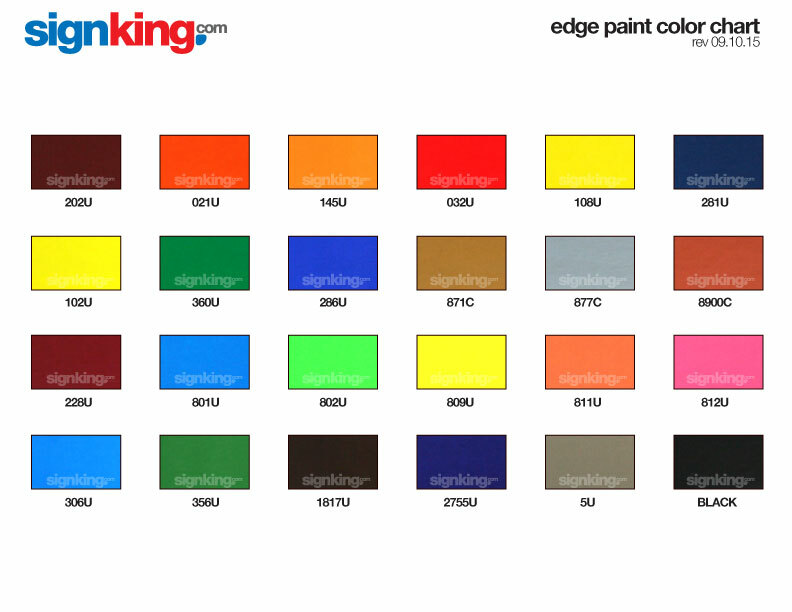 - 12pt Smooth - This matte finish stock has a very slight gloss sheen, with NO UV coating. - 100# Linen Cover - This textured paper has criss cross pattern which resembles linen. - 100lb Desert Storm - This coverstock is 100% recycled and looks like a brown paper bag, also known as Kraft paper cardstock. Embossing is the process of creating a raised image into the paper. An embossed pattern is raised against the background from the front view and from the back view you will see a slight debossed pattern sunken into the surface of the material. On multi layered cards, the debossing is hidden in between layers. Give customers an edge over the competition with these Deluxe Black EDGE Pinstripe Cards! Sturdy, multilayered EDGE Black Cards consist of a black-colored core fixed between two layers of bright white, premium uncoated face stock. The bold edge color on these 32pt ultra thick cards gives them a sleek and modern appeal so they stand out from the rest! ** Because the face of this stock is uncoated, we don't recommend heavy ink coverage in the background. It may soak up much of the ink changing the tone of the background color. Also heavy or darker colors of ink may crack slightly on the edges on uncoated stock. Instead a clean logo and text looks best on this cardstock. Cotton Cards with deboss letterpress are the industries bet kept secret. With this card you are able to create effects no other card can match. A beautiful mix of old world craftsmanship with a contemporary look and class. letterpress exemplifies traditional handcrafted and luxurious works of art. From minimalistic to extravagant, Cotton Cards leave nothing to be desired. This full color foil printing process allows you to add a metallic, foil effect to the whole business card. We print full color right onto foil paper to create the ultimate business card for a full color metallic qualitiy. Silk lamination on both sides make a soft finish which you can add even more effect to such as spot gloss, foil, emboss, etc. - Colors will be Metallic and ANY white areas will be Silver, UNLESS specifically "white blocked" in the proof. - "White Blocking" does not completely block out the foil. White areas will be slightly Ivory in color. - Black Flood Backgrounds will not completely cover the foil paper and will have "silver specks" upon closer inspection, that will be further mitigated by "white blocking". This is not very noticeable, as such does not usually affect the overall effect. Radiance never seen before –€“ dazzle you can afford! Akuafoil gives you a wide range of CMYK colors with a sparkling foil finish and an ideal reflection that is priced to give you a true competitive advantage. State-of-the-art features allow you to produce large solid areas as well as reversed out areas of foil. You can produce foiled half tones, gradients and have multiple colors in foil on the same design. The design possibilities are limited only by your imagination, giving you an exquisite edge. Our business cards printing services in San Diego is highly supported by our graphic design team. We have the hundreds variety of business card templates, clipart and stock pictures which are all legitimately just be utilized by us. This is a major favorable position of every one of our clients for taking our business cards printing services in San Diego. Apart from the huge inventory of graphics items, our web 2 print application also efficient enough to help you online design your own business cards. You are always welcome to upload your own business cards to our website and take the graphic design team's help to fine tune it with some expert touch. Our business cards store is very much associated with everywhere throughout the USA. Our business cards store is neighborhood to San Diego, Los Angeles, California and different urban communities in USA. Our accomplice shipping organizations give outrageous marked down rate to business cards so we can bolster you locally sparing cost for any business cards. Our shipment organizations for business cards are so fast and proficient that it works like we are functioning as though business cards San Diego, business cards Los Angeles, business cards California, business cards USA. So wherever you are in San Diego, Los Angeles, California and different urban communities in USA and looking for business cards San Diego, business cards Los Angeles, business cards California, business cards USA, please call us and with respect to citation. For business cards call 619-295-2700. Our quick computerized business cards printer's are rapid as well as profoundly productive to convey the business cards yield with exactness and with no twisting. All our business cards are printed by computerized digital printers with most elevated amount of value and precision. We check the art work design then it will go to the business cards printers for digital printing. We give standard size business cards as well as big custom size business cards so it could be any size. We are master in custom business cards. Recommended reviews for Sign King's business cards printing. Really impressed with this business. I have used their services for business cards, banners, stickers, and more and I am impressed with the quality, turnaround time, and friendly staff. I would recommend using this company! I love working with Sign King. Jamaica and Sequoia always helps me with every project and most of the time its last min things. The work is amazing and always on time. Sequoia is so cool! I call her 5 times a day when we work together and she always calls me back when I leave a message. Some times I don't know how to express to her what I want or need but she gets me ! Thank you Sign King for helping me and my business. Sign king is the go to printer for my team. We've had them print everything from business cards, to luxury magazines. They are highly responsive, offer quick and clear direction for print formatting, and swift turnaround times. The paper quality and color matching can't be beat. I've worked with other printing vendors, and as a graphic designer I can say not many have as much attention to detail as Sign king. Amazing service and quality. I am a Realtor and I recently ordered new yard "For Sale" signs & open house signs. They were super helpful with putting together my artwork, highly knowledgeable on what the best materials are & with great/prompt communication. All while being very well priced against other bids I received. All my future print business will go to Sign King. Sign King has been incredible to work with me and my team to help us get ready for our big event! Jamaica has been so helpful and patient as we continue to iterate our final designs. The service at Sign King is amazing and FAST which when it comes to printing and production couldn't be more appreciated :) Couldn't recommend this printing shop more! Sign King go out of their way to make sure our company is always happy with the many items we order. Great prices and turn around on products! Highly recommend! Jamaica a good and dear friend of mine for many years, has helped me finish designing my company logo. This has been such a fun and exciting process for me. Thank you for all your help, guidance and hard work. You have outdone yourself again my dear friend. Infinite thanks! Sign King's are dependable, affordable and just plain AWESOME! I will use no one else.